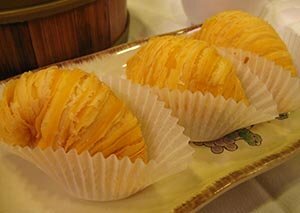 Delicious, soft, durian fruit is one of the popular tropical fruits known for its one of a kind fragrance and flavor. Durian is widely recognized as the "King of Fruits" in many South-East Asian countries. The durian tree is tropical in origin and belongs to the family of Malvaceae, in the genus, Durio; a large family of plant species which also include some of the interesting relatives such as okra, cocoa beans, hibiscus, and cotton. It is botanically known as Durio zibethinus. Inside view of durian cut section. Golden-yellow flesh bulbs (Durio zibethinus) Durian fruits in the market. Note for the dark green husk covered with sharp thorns. The exotic durian is native to Brunei, Indonesia, and Malaysian rainforests. While there are 30 known species of Durio exist, only 9 of them have been identified for producing edible fruits. Durian tree starts bearing fruits after four or five years after plantation. The tree can grow up to 50 meters in height depending on the species. Durian is a seasonal fruit; its season lasts typically from June until August which coincides with that of the other tropical specific fruits like mangosteen, jackfruit, and mango. Durian fruit is distinctive for its large size, unique odor, and formidable thorn-covered husk. It can reach up to 30 cm (12 in) long and 15 cm (6 in) in diameter, and typically weighs one to four kilograms (two to seven lb). In shape, it varies from round to oblong; the color of its husk (rind) is green with brown, and its flesh features creamy-yellow to saffron color bulbs depending upon the species. The flesh or pulp of durian can be consumed at various stages of ripeness and is used as flavoring agent in a wide variety of culinary and sweet preparations in Southeast Asian cuisines. Durian seeds are small, round to oval shape kernels and appear like that of jackfruit seeds. Although boiled seeds can be eaten safely, many discard them. The seeds feature a bland taste akin to jackfruit seeds. Its edible flesh emits a distinctive odor which can be described as robust and penetrating, appreciable from far even while its husk is intact. This unusual stinky and intense odor of the durian fruit may have prompted many people to express diverse and peculiar opinions ranging from profound gratitude to disgusting! Durian, like other tropical fruits such as Banana, avocado, and jackfruit, is high in energy, minerals, and vitamins. 100 g fresh fruit carries 147 calories. The fruit is made of soft, easily digestible flesh made of simple sugars like fructose and sucrose that when eaten replenishes energy and revitalizes the body instantly. Though it contains a relatively higher amounts of fats among the fruits, it is free from saturated fats and cholesterol. Durian is rich in dietary fiber, which makes it a good bulk laxative. The fiber content helps protect the colon mucous membrane by decreasing exposure time to toxins. It also helps bind and eliminates cancer-causing chemicals from the gut. The durian fruit is a good source of antioxidant vitamin-C (about 33% of RDA). Consumption of foods rich in vitamin-C helps the human body develop resistance against infectious agents and scavenge harmful free radicals. It is an excellent source of health benefiting B-complex groups of vitamins; a rare feature for fruits, such as niacin, riboflavin, pantothenic acid (vitamin B5), pyridoxine (vitamin B-6) and thiamin (vitamin B-1). These vitamins are essential for the body as it requires them from external sources to replenish. Further, it also contains a good amount of minerals like manganese, copper, iron and magnesium. Manganese is utilized by the body as a co-factor for the antioxidant enzyme, superoxide dismutase. Copper is required in the production of red blood cells. Iron is essential for red blood cell (RBC's) formation. Fresh durian fruit is a very rich source of potassium. Potassium is an essential electrolyte inside cells and body fluids that help controlling heart rate and blood pressure. Additionally, it also contains high levels of essential amino acid, tryptophan (also referred as "nature's sleeping pill"). Tryptophan in the humans metabolizes into serotonin and melatonin; the two neurochemicals that play a vital role in sleep initiation and soothe nervous irritability. Durian fruit is native to Southeast Asia. It is sold in markets all over the East-Asian world and also imported into the United States and Europe. People have differences in preferences regarding ripeness, while some like slightly ripen, tart flavored durians, others may prefer to cherish soft, and over-ripened. Usually, ripe fruit that falls off the tree is gathered and sold at markets. In the stores, choose a durian fruit with firm stalk. Outside its natural habitat, durian is one of the expensive fruits; some of its varieties like D24 (Sultan) are in high demand and therefore, may command a higher price. The fruit can also be stored inside the refrigerator for few days. In the stores, choose a durian fruit with firm stalk. Outside its natural habitat, durian is one of the expensive fruits; some of its varieties like D24 (Sultan) are in high demand and therefore, may command higher price. The fruit can also be stored in the refrigerator for few days. On its exterior, the durian fruit is fully covered with sharp spikes capable of inflicting cuts; therefore, one should be careful while handling it. Cut open the fruit longitudinally the same way you do in Jackfruits to expose underlying creamy yellow flesh (pulp). Slice the flesh to remove seeds. Durian fruit used as a flavor base in a wide variety of sweet preparations such as traditional Malay candy, ice kachang, dodol, biscuits, etc. It is also used in the preparation of ice-cream, milkshakes, and cappuccino. Durian (yellow and red-fleshed) is traditionally used to prepare a fermented paste condiment (tempoyak) in Malaysia and Indonesia. The fermented durian is also added to prepare fish tempoyak curry made of freshwater catfish and fermented durian paste (gulai tempoyak ikan patin). Ikan brengkes, fish cooked in a durian-based sauce, is traditional in Sumatran islands in Indonesia. Unripe durians may be cooked as a vegetable in variety of dishes. Durian seeds, which taste similar to jackfruit seeds or yam, can be eaten boiled or roasted. <<-Back to Fruits from Durian fruit. Visit here for an impressive list of all variety of fruits with complete illustrations of their nutrition facts and health benefits.